Remington has been manufacturing ammunition for more than 150 years, so it is no surprise that they have mastered the art of creating high quality range ammo. 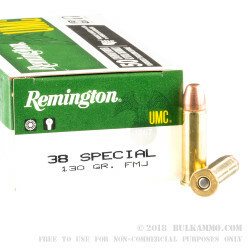 This 38 Special ammo is brass cased, boxer primed, non-corrosive, and reloadable. Each round features a 130 grain metal case projectile that leaves the muzzle at around 790 feet per second. 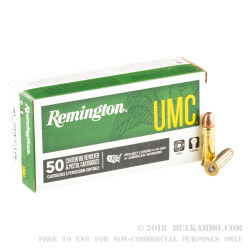 If you are unfamiliar with Remington ammo, you should note that a "metal case" bullet is essentially the same thing as an FMJ, but Remington has a different name for it. 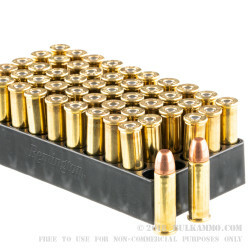 Remington ammo is American made, so grab a case of 500 rounds today and get your revolver spinning! Q: I have a new Ruger GP100- 357 Mag. I am looking for some clean (FMJ or similar) ammo to minimize lead build-up and exsessive cleaning. Do you offer this type of round in 357 mag. and/or 38 sp? Thanks. A: This 38 Special ammo will work well for your interest of reduced lead exposure while shooting. 38 Special ammunition will safely fire in your 357 Magnum pistol as well. Additionally, Remington is known for their clean shooting ammo, which contains all non corrosive components.